Whether you're shopping for a stylish Mary Kay cosmetic bag or a chic, carry-all wristlet for a night on the town, this Mary Kay bag combo is perfect for any occasion. 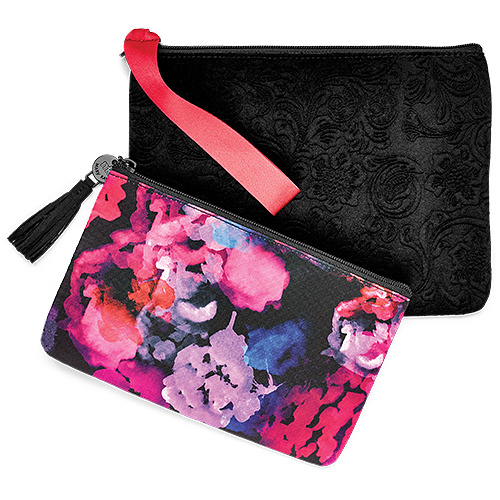 The black velvet wristlet features a floral pattern and zip closure with beautiful pink ribbon wrist strap. The cosmetic bag features a splash of colorful flowers with a tasseled zipper. Wristlet dimensions: 9 1/2" x 7"
Cosmetic bag dimensions: 8 1/2" x 5 1/4"